The Euro surged towards 1.1419 yesterday, but couldn’t keep its gains, after the US Dollar recovered the ground lost following a GDP print of 2.6% which is above the 2.4% expected. It seems that the US economy therefore, powered by the White House's $1.5 trillion tax cut and increased government spending, is slowing less than expected amid solid consumer and business spending. The US Dollar also got support from comments of US Advisor Kudlow, who said that “fantastic” progress was made last week between China and the US. Today, both economies will release very important figures throughout the day, traders will mainly focus on the US and EU Manufacturing PMI data as it can reveal a lot about the state of the two economies. The Euro, for the third day in a row, was unable to close above 1.14 after reaching as high as 1.1420. 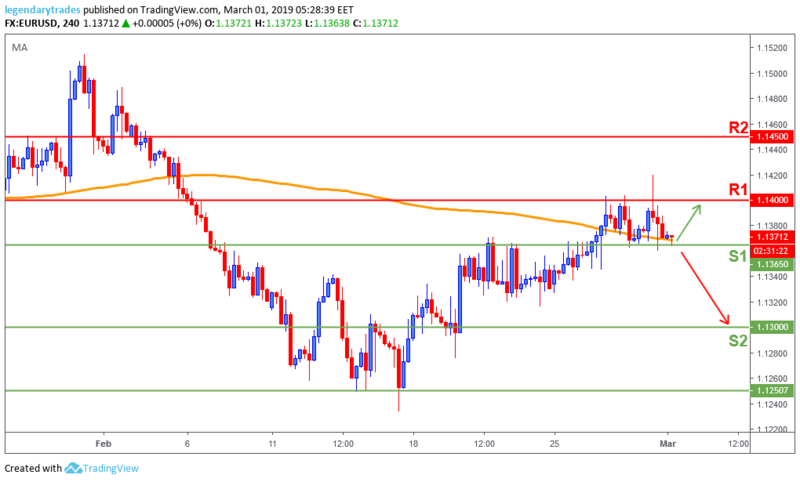 Price reversed and found support at the same level; 1.1365 (S1) and the 200-day moving average (Orange line). If the bears successfully break below 1.1365 (S1), it will likely further weaken the Single Currency towards 1.13 (S2) support. However, the bulls need a break above 1.14 to continue this recent bullish trend.